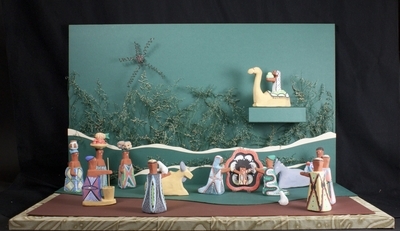 The wealth of African nativity sets cannot be summarized in this one set from the Ivory Coast. In Africa, there exist many nativity scenes of different styles, frequently carved in wood or made from brass and soapstone. This set is from clay and painted with chalk. It has an ornamental beauty. Its sober lines and square volumes are reminiscent of contemporary art; the intricate and colorful design of the dresses is a hymn to life as only African culture may conceive it. The magi bring gifts, as they would, but they are outdone by a group of impressive women carrying on their heads heavy loads for the Child. The representation of the Child is remarkable as he lies or stands with outstretched arms within the open petals of a rose. There exists a longstanding symbolic relationship between Christ and the rose. He is the center of life and love. Handsculpted clay figures painted with chalk including depictions of Mary, Joseph, and infant Jesus. The figures were made by Kahola Studios in Katiola, Côte d'Ivoire. Exhibition label written by Father Johann G. Roten, S.M. originally for exhibition entitled "African Symphony" held at Roesch Library, University of Dayton.